The players are making their way out towards the middle and we are just about ready for play to get under way on day two. Dhammika Prasad will open the bowling from the other end. His second ball is short and wide and although Sam Robson doesn't make a clean contact, he gets enough on it to send it over the slips and down to the third man boundary for four. Robson then works two through the leg side before dabbing another four down to fine leg to make it 10 from the over. Cook gets his first runs of the morning by flicking Eranga through midwicket for three but there is no further scoring from the over as Robson leaves a couple outside off stump. [wicket]Sri Lanka have the breakthough! Cook hangs his bat out to a length ball outside off stump from Prasad and edges it to Sangakkara at first slip, the Sri Lanka veteran taking a fairly straightforward low catch. 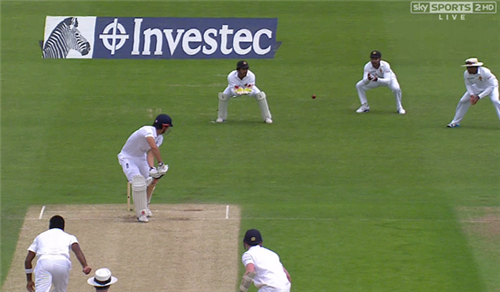 Gary Ballance is the new man in and takes a watching brief wherever he can as Prasad completes a wicket maiden. Sri Lanka start to exert a little bit of pressure as Eranga's tidy bowling forces Robson to see out a second straight maiden over. @SkyCricket time to relinquish the captaincy cooky. Give it to broady and let cook focus on batting. Ballance gets off the mark when a slower, shorter delivery from Prasad sits up right in the hitting zone and the left-hander duly dispatches it away to the square leg boundary for four. Prasad tidies his length up for the rest of the over and there are no further runs. 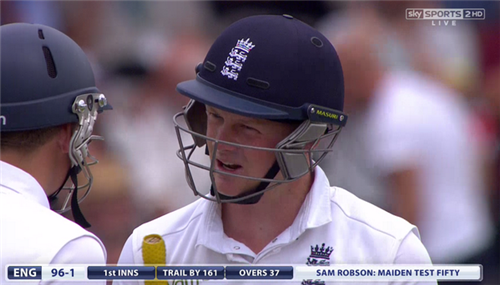 Eranga concedes a no-ball before offering a full one up to Robson, who drives it back down the ground for four runs. Robson then leaves the last couple of deliveries and another over is in the books. 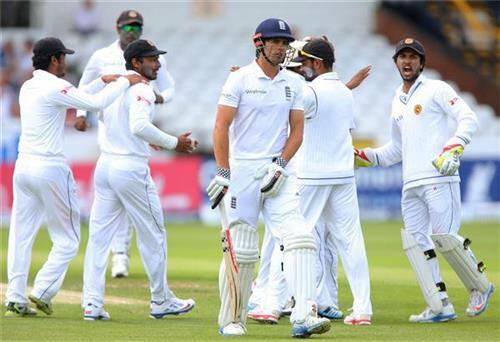 England are still odds-on at 1/3 to win the second Test despite the fall of Cook's wicket, with a Sri Lanka victory and the draw both priced at 11/2. Bet in-play with Sky Bet here. Ballance plays and misses at a wide one from Prasad before working away the second ball of the over for a single. Prasad gets some extra bounce which has Robson in a spot of bother but then has to watch as the batsmen trade singles to end the over. Eranga continues and serves up five dot balls before Ballance edges a single off his pads from the last delivery of the over. Prasad keeps chipping away and completes another maiden when Ballance is unable to fashion any scoring opportunities from his decent line and length. Robson threatens to glove one behind down the leg side but pulls out of the shot just in time and Robson goes on the defensive for the rest of the over, which ends up being a maiden. The first bowling change of the morning sees Nuwan Pradeep replace Prasad. The new seamer concedes a single to Ballance off his first delivery but tightens things up thereafter and ends up conceding just one run from the over. Ballance leave a couple from Eranga before the left-hander works one through the leg side for a single. A no-ball adds another to England's tally but no further runs come off the bat for the rest of the over. Pradeep rifles a jaffa past Ballance at 87mph but somehow fails to find the edge of the Yorkshire player's bat. Two more great deliveries do find a thickish edge, but the ball falls well safe on each occasion. Ballance is finally able to push a single to extra cover and Robson dabbles a couple through midwicket to end the over. Time for drinks. 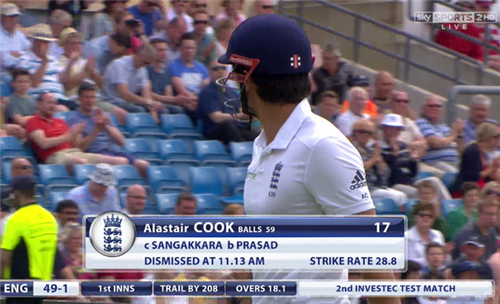 @SkyCricket from @AltCricket: Alastair Cook's Test decline? Sri Lanka opt for spin after the drinks break as Rangana Herath is brought into the attack. 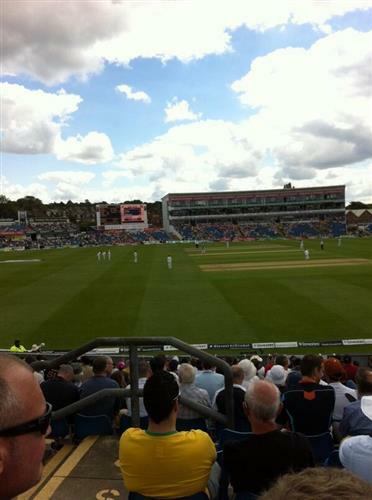 The left-armer deceives Robson with some decent spin and the England opener is lucky to see his edge fly past slip and down towards third man for two runs. A single from Ballance was the only other run from the over. [davidlloyd]Big spin for Herath. That delivery to Robson was heading down the leg-side, as was the wicket-keeper, but it gripped and turned to catch Robson's edge wide of slip. Ballance leaves three Pradeep deliveries before drilling the fourth to the fielder at backward point. The next ball is short and wide and Ballance cuts it away behind square and away to the boundary for four runs. He then runs a single to make it five from the over and retain the strike. Ballance strikes another boundary as he sweeps a full one from Herath away to the square leg boundary. He defends the other five deliveries well and there are no further runs from the over. Pradeep keeps his line and length tidy and Robson blocks the paceman back for a maiden. Is the captaincy impacting Cook's performance with the bat? England have a little more success off Herath, Ballance whipping the spinner through the leg side for two runs and then adding a single from a full delivery later in the over. Pradeep offers a full and wide one up to Robson but the batsman only succeeds in finding the man at cover point. He makes up for that missed opportunity later in the over when Pradeep bowls a similar delivery and Robson this time finds the gap and sends the ball racing away for four. He then drives another one through the covers to earn a second boundary from the over. Prasad replaces Herath at the Kirkstall Lane end. Ballance looks untroubled negotiating a maiden as the seamer makes a solid return to the attack. Pradeep almost finds Robson's edge as the opener dabs at an arrow straight delivery outside off stump. The right-hander is looking a little nervous but an uppish cut through the slip cordon and away to the third-man boundary brings up his half-century and should go a long way to dispelling those jitters. Ballance takes a single off Prasad, with some good fielding from Pradeep running in from deep square leg ending any thoughts of a second. There is then a delay as the umpires inspect the ball for damage and on the resumption a dot ball completes the over. Ballance comes down the wickets and lofts the returning Herath over mid-on and away to the ropes for a boundary which brings up the 100 for England. There are no further runs from the over. Robson flicks Prasad through midwicket for a couple of runs before working him through the leg side again for a single. Ballance evades a bouncer to complete the over.